The subcontinent had great importance in the history due to natural resources. It attracted Turks, Afghan rulers and central Asian rulers. Apart from this the Britishers also took interest in the region. They settled here as traders in the reign of Mughal Emperor Jahangir. Later on, they came across the weakness of Muslims and finally they took control of whole sub-continent. The traders became the masters of the region. Muslims and Hindus joined the British government. The government made such policies which were totally antagonistic to local traditions. The policies Pushed them against Britishers. They fought war against the state. uprising” as revolt. They thought that local were the servants of state and they should not have fought war. The indigenous writers considered if war of independence. In their opinion, the Muslim 8! Hindu soldiers Fought for their freedom and for their legal rights from which they were neglected. In general, if we think for a while, we will come to know about the fact that the Britishers were not local ruler rather they were foreigners who deprived their rights and it was right of both Muslim and Hindu to protect their land from foreigners. So that’s why we always consider it as war of independence. The Britishers treated Indian bestially. They were sold as slaves in Europe. They were usedas guards. 'Iheir resources were used for London, Under these circumstances, the uprising of 1857 will be considered as war of independence because they fought for homeland and it will not be called as mutiny. We have evidence from British history. 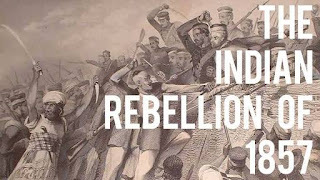 Benjamin Dissaeli, the opposition leader of British parliament at that time, declared the uprising of 1857 was not mutiny but it was their legal right. From the above brief discussion, we can simply say it was war of independence. Although it was joint struggle of both Muslims and Hindus,But Muslims were targeted as cause of it. also took care of interest of Hindus.So that's why Sir Syed Ahmed Khan told Muslim not to cooperate with congress and finally they organized their own political party named as All India Muslim League.